As the university’s Equality Advisor and LGBT+ Staff Network co-chair, I specialise in LGBT+ (Lesbian, Gay, Bisexual, Transgender) inclusion for staff and students at the university. My work involves providing advice and support on LGBT+ issues at work and study. I also lead on the university’s annual Stonewall Workplace Equality Index application, which is a national award dedicated to advancing LGBT+ inclusion in the workplace (we’re currently ranked as the 29th top employer in the UK, and are one of the UK’s Top 11 Trans Inclusive Employers). LGBT+ inclusion at the university is a large remit that includes various issues such as inclusive policies and procedures, welfare and wellbeing, diversifying curriculum, training on appropriate use of language, and ensuring visibility of LGBT+ role models. 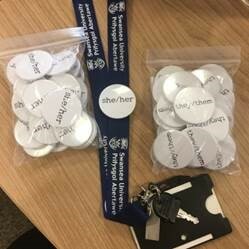 One of the specific things I’ve recently introduced at Swansea University in this area is pronoun pin badges for staff. I’ve issued these to staff to wear on their lanyards, to let others know what their pronouns are. You can’t always know someone’s pronouns (or their gender) by looking at them. At the university, we come into contact with a wide range of staff and students on a daily basis, some of whom will be trans and genderqueer, possibly without us even knowing it. Wearing a pronoun badge is a simple but effective way of signalling that you respect people’s pronouns and their gender identity, which can mean a lot for trans and genderqueer members of staff who may feel invisible, or may be struggling with being trans at work or study. A personal pronoun is a type of noun used to refer to another person in place of their name. Common personal pronouns are she/her/hers, he/him/his, or they/their/theirs. Sarah brought an umbrella with her. Jo was tired so they went to bed. What different pronouns are there? In the English language, personal pronouns usually denote someone’s gender. The pronouns in bold above are known as gender-neutral or gender-inclusive pronouns, as they do not associate a gender with the person using them. These pronouns may be used by people who identify as non-binary or genderqueer (these terms mean someone whose gender identity isn’t exclusively male or female), but they may also be used by people who identify as men or women. Never refer to someone as “it” or “he-she” as these terms are hurtful and dehumanising. Doesn’t the word “they” refer to a group of people? Not necessarily – “they” can be used to refer to a singular person, either because you do not know their gender, because you do not want to specify any particular individual, or because this is the pronoun they identify with. I have a missed call on my phone; they didn’t leave a message. I feel that if someone is doing a good job, they should be rewarded. Robin was running late because their car broke down. Singular “they” is considered grammatically correct. You can’t always know someone’s pronouns (or their gender) by looking at them. At the university, we come into contact with a wide range of staff on a daily basis, some of whom will be trans and genderqueer, possibly without us even knowing it. Asking and correctly using someone’s pronouns is one of the most basic ways to show your respect for their gender identity. When someone is referred to with the wrong pronoun, it can make them feel disrespected, invalidated, dismissed, alienated, or dysphoric. How do I ask what pronouns someone uses? It’s okay! Everyone slips up from time to time. The best thing to do if you use the wrong pronoun for someone is to say something right away, like “Sorry, I meant (insert pronoun)”. If you realize your mistake after the fact, apologize in private and move on. Avoid repeatedly mentioning how bad you feel that you messed up or how hard it is for you to get it right, as this can make the person who was misgendered feel awkward and responsible for comforting you. What if I hear someone else make a mistake? You may hear one of your colleagues or students using the wrong pronoun for someone. In most cases, it is appropriate to gently correct them without further embarrassing the individual who has been misgendered. This means saying something like “Alex uses the pronoun she”, and then moving on. If someone is being repeatedly misgendered, it may be appropriate to approach them in private and say something like “I noticed that you were getting referred to with the wrong pronoun earlier, and I know that that can be really hurtful. Would you be okay with me taking that person aside and reminding them about your pronouns?” They may not want you to intervene, but your considerateness will be greatly appreciated. Want your own pronoun pin badge? Contact Cath at lgbtplus@swansea.ac.uk.